Honeysuckle grew up in a farmhouse near Chichester. She attended the 'posh' Roedean Boarding School for Girls, in Brighton, and later gained an English degree at Pembroke College, Oxford. In 1997 and 98 she was kept very busy with four episodes of Have Your Cake and Eat It (1997); eighteen episodes of The Wild House (1998) and parts in the TV mini-series Close Relations (1998); a Ruth Rendell Mystery The Orchard Walls (1998) and a 1999 episode of Midsomer Murders. 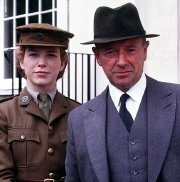 Although Foyle's War took up a lot of her time over six years, she also appeared in the film Red Mercury (2005) also Cards on the Table (2005) and The Inspector Lynley Mysteries (2007) for TV. 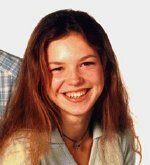 Since then she has been seen on TV as Julie Nowak in the The Bill (2009). In the theatre, Honeysuckle played the governess in a 2008 production of Henry James' The Turn of the Screw; has toured as Viola in Shakespeare's Twelfth Night; and recently played Eva in Alan Ayckbourn's brilliant play Absurd Person Singular, which I went to see at Nottingham's Theatre Royal. photographs and I complimented her on her fantastic performance as Eva in the play. Before she left ("to go and have a pint! "), I got a kiss from this very talented and extremely pretty actress! father is in advertising and their mother, Susan, is now the Conservative candidate for York. Both Honeysuckle and Perdita appeared as the younger & older versions of the same character, Millie, in Catherine Cookson's The Rag Nymph (1997). 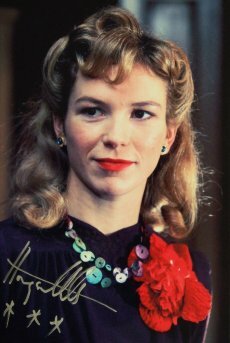 In 2002, Honeysuckle was first seen in the role that has made her well known to a wider public, Samantha Stewart in the BBC's WW2 series Foyle's War. Sam Stewart is a vicar's daughter who is transferred from the Mechanised Transport Corps to act as driver to Det Chief Superintendent Foyle played by Michael Kitchen. and you had to turn the entire wheel sharp." 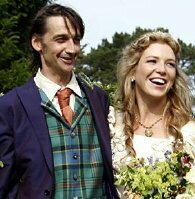 lots of information about Honeysuckle and the other cast members. and 55 minutes, and raising over £8,000 for charity. deprived countries), Starlight Children's Foundation, the Amber Foundation and The Woodland Trust. Barlavington, in West Sussex, and she wore a medieval-style dress that she had bought from an antiques shop in Hastings for £280! They live in Kensal Green, London (with their Tibetan Mastiff, Kensal) in a small cottage that Honeysuckle bought in 2004.
as Aunt Vera. 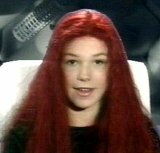 She followed this in 1995 & 1996 with two different teenager roles in ITV's long-running police 'soap' The Bill. abused teenagers, Tom (Ben Whishaw) and Jessica (Jenna Harrison). Honeysuckle plays Jessica's older sister Sarah. Daily Mail - Foyled Again!